Dried red chiles — strung into ristras — hang in many New Mexican homes and are used for cooking throughout the year. The state is the largest producer of chiles in the United States. Recipes for breakfast quesadillas with New Mexican red chile sauce and green chile stew. Place whole peppers over a gas or charcoal grill or under a broiler. They should be turned frequently with tongs until all sides are charred. Put the charred peppers into a plastic bag and let sit until cool enough to handle, about 15 minutes. Wear gloves to peel peppers, to keep seeds from eyes and skin. Peel the peppers (the skin should come right off) and remove the seeds and stems. Chop the pepper and set aside until ready to use. They may also be frozen in plastic bags with all the air squeezed out. Bonny Wolf for NPRBaskets of green chiles are abundant this time of year at the Santa Fe Farmers Market. Dairy products are the best way to combat that burning sensation. There is a substance in dairy products that counteracts the heat in the chile. So if your mouth feels like it’s on fire, drink a glass of milk. Try to keep the chile away from body parts. The oil can burn your skin and hurt your eyes. Wear gloves when handling chiles. The chile’s heat comes from a chemical compound called capsaicinoids. They are located on the membrane of the chile. Many people think seeds are where the heat lives. Actually, they absorb it from the membrane. Bonny Wolf for NPRChile farmer Matt Romero turns his roaster by hand at the Santa Fe Farmers Market. Bonny Wolf is Kitchen Window‘s contributing editor and a commentator on NPR’s Weekend Edition Sunday. She also hosts the Kitchen Window podcast. Her book of food essays, Talking with My Mouth Full, is out in stores. You can find more information at bonnywolf.com. The second I stepped out the door of my friend’s house in New Mexico, I noticed a sweet-smoky-earthy smell. No matter how far I walked, the aroma was inescapable. During the next 10 days, I learned that whether you’re driving on a dirt road in the barren mountains or standing in the parking lot of an Albuquerque supermarket, the deliciously pungent aroma of the roasting of the year’s chile crop permeates the New Mexico air from late August through September. New Mexico is the largest producer of chiles in the United States. But in New Mexico, chiles are more than a crop. They’re a culture, a way of life. It is unimaginable to New Mexicans that people eat food untouched by their state’s chile. The Spanish conquistadors brought chiles to New Mexico in the 16th century, and they’ve been part of the cuisine and culture ever since. The chile is so valued that it’s been named the state vegetable (even though it’s technically a fruit). Green chiles are roasted, peeled, seeded and either used right away or frozen. 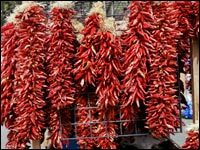 Dried red chiles are ground into powder or strung into the lovely, deep-red ristras — strings in Spanish — you see hanging in many New Mexican homes. Northerners usually hang ristras for decoration while New Mexican cooks use the pods throughout the year to season food. Because the climate is so dry, there’s no fear of mold. This time of year, chile roasting is everywhere. You can buy a gunny sack of chiles at the supermarket and take it to the parking lot where someone with a propane-fired, mesh metal roasting drum will roast them for you for a couple of bucks. Or you can buy them already roasted. 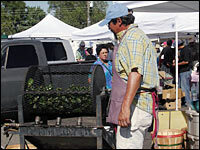 I went to the Santa Fe Farmers Market, where chile farmer Matt Romero turns his big roaster by hand. The six-inch-long green chiles tumble around and around until the tough outer skin is charred and blistered. They’re bagged and piled on a table for sale. “We sell them as fast as we roast them,” he says. Chile heat varies from year to year depending on the weather, the soil and other factors out of the grower’s control. Most New Mexico chiles are medium hot. The modern New Mexican chile was developed in the late 1800s by Fabian Garcia, a horticulturalist at the New Mexico College of Agriculture and Mechanical Arts — today’s New Mexico State University. He wanted to breed a more standardized New Mexican chile. In 1896, the sheriff of Ventura County, Calif., brought chile seeds back from a trip to New Mexico and planted them near Anaheim. The name stuck, and Anaheim chile is the generic name often given to the New Mexican chile. 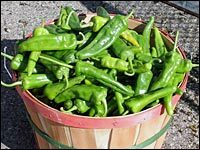 However, there has been much breeding and improving over the years, so you’ll see chiles called Espanola, Sandia, Nu Mex, Big Jim, Long Green and others. New Mexico cuisine has been influenced by several cultures: Pueblo Indians, Spanish, Mexican and Anglo. They’ve been blended together with the chile at center stage. Never call it a chile pepper, by the way, or you will be mocked. Little in traditional New Mexican cuisine is untouched by the chile: blue-corn enchiladas, quesadillas, carne adovada (pork in adobo sauce), sauces and salsas. The chiles rellenos in New Mexico are the real thing: fresh green chiles, roasted and peeled, then stuffed with cheese, batter coated and fried. Yum. I was particularly taken with green chile stew — sort of the beef stew of New Mexico. And after a bad night, you can get hangover stew, green chile stew with two eggs on top. The chile has moved way beyond the traditional. Hamburger joints sell green chile cheeseburgers, there’s green chile sushi, green chile bagels, green chile sorbet and, of course, green chile pizza. Another New Mexico specialty is the sopapaillas that are served with your chile-infused food. These wonderful puffed breads are the state’s own invention. They’re made of flour and a little lard and deep fried so they puff up like little pillows. They are served as bread would be and are to be slathered with honey. You can approximate the foods of New Mexico in other parts of the country. Some poblano or Anaheim chiles will give you the general idea but, really, the flavor’s not close to as good. There are, however, many mail-order outlets. The best way, though, is to visit the state during chile season, breathe deeply and bring a bag of roasted chiles home with you. They freeze well.